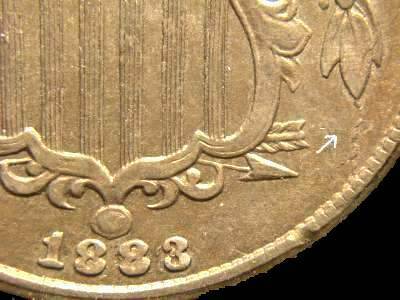 On this page, we will take a look at the 1883/2 FS5c-013 (F-08) shield nickel. Here is a picture of the date area of a particularly nice example. 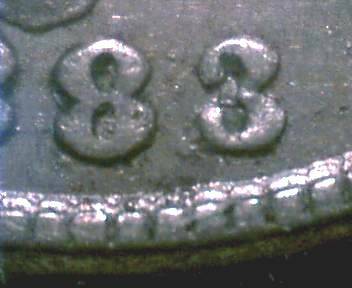 For this variety, the left base of the 2 is approximately halfway between the 8 and the 3. 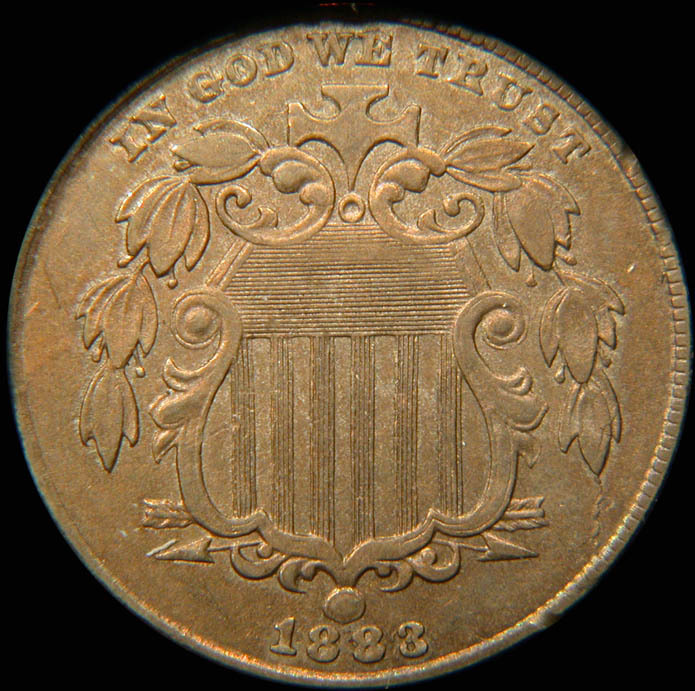 This is by far the most dramatic of the 1883/2 shield nickel varieties. However, it may be found in different die stages where the underlying 2 may not be quite as visible as in the above example. 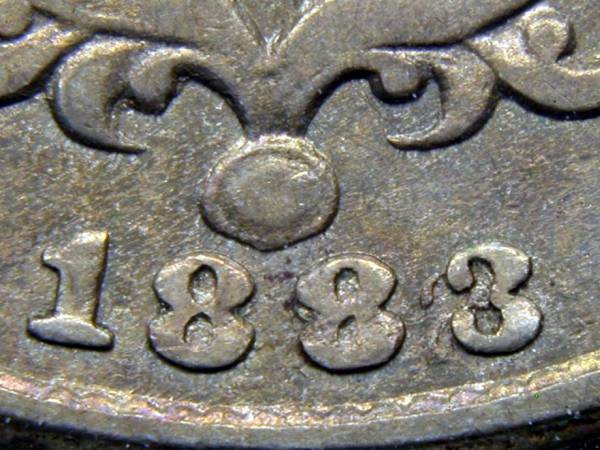 Here are some more examples of FS5c-013, showing how the date may appear differently on different coins. 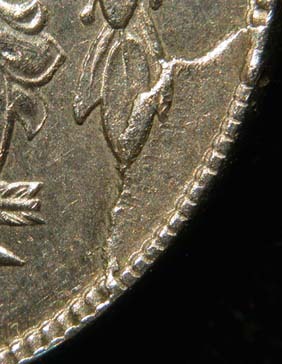 The third example below is the same coin as the picture above. These photos were taken with a microscope. 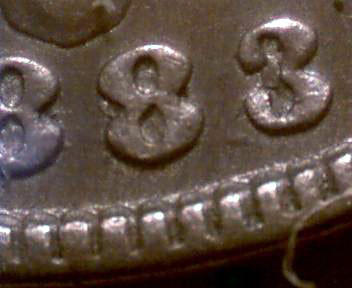 Although the appearance of the overdate differs somewhat, all three of the images above show the strong remains of a 2 between the second 8 and the 3. I have not seen reference books that address die stages of FS5c-013, but I have been able to locate four distinct stages. 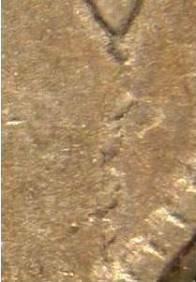 The stages are differentiated by looking for a die crack or break extending downward from the bottommost leaf on the right. The picture on the right shows where to look (see the white arrow). Note: The example above shows the overdate very clearly, including the flag of the one (white arrow). The very late die stage was unknown until March 2015, when it was discovered by John D. Call. Because of the large difference between the late die stage and the very late die stage, John and I theorize that more stages intermediate to those two remain to be discovered. 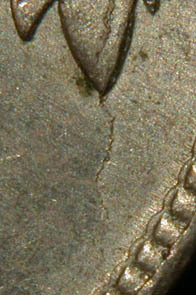 The very late die stage also shows a heavier crack to the left of the cross than the preceding stage, plus a new crack off the bottom leaf left. Most interestingly, die stages 3 and 4 appear to show the most apparent underlying 2. This is not an artifact of the photography - it looks like this in person too. I am puzzled why the latest die stage would show the most apparent overdate. Please email me if you have any ideas as to why that would be so. Update! I have had some responses about why the die stage 3 appears to show the most apparent underlying 2. 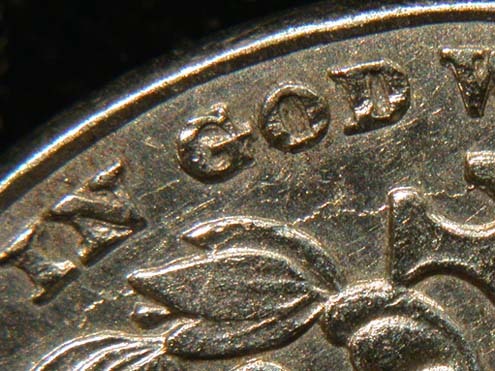 Alan Herbert (the renowned AnswerMan and numismatic author) has stepped forward with the possible explanation that the 2 is more apparent on the later die stage because the mint increased the striking pressure. 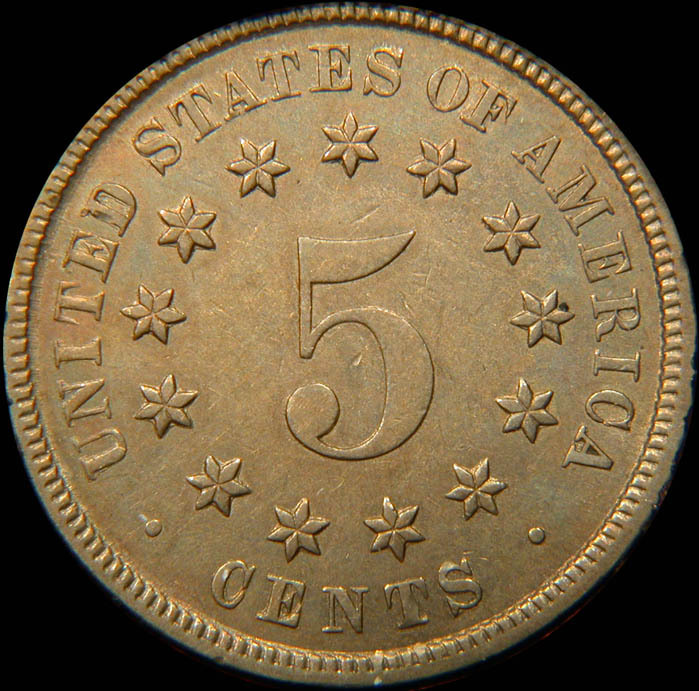 Given what we know about the mint's difficulties in getting shield nickels to strike up properly, the idea that they tinkered with the striking pressure is quite logical and reasonable. JT Stanton (co-publisher of "The Cherrypickers' Guide to Rare Die Varieties) has suggested that instead of the striking pressure being increased it was decreased. I found this counterintuitive, but JT and at least one other correspondent (Brad Meadows) have pointed out to me that broadstruck coins frequently have a better struck appearance than "normal" coins - this despite the fact that a broadstruck coin should be under lower striking pressure as it is not restrained by the collar die. JT further says that given the mint's difficulty with shield nickel dies breaking, he thinks it is unlikely that the striking pressure would have been increased as that would have made early die failure more likely. 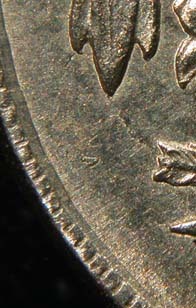 Ken Hill (shield nickel collector extraordinaire and owner of more 1868 shield nickels than anyone else on the planet) came up with the theory that the mint saw how noticeable the overdate was and attempted to hide the overdate somewhat by using some kind of filler material on the die. Over time the filler material eroded away and exposed the overdate even more. Ken agrees that while this is a neat idea, there is no evidence anywhere in mint records for shield nickels (or for any other series) that filler material was ever used in this manner. Dennis Paulsen (researcher of the 1868r68 hub varieties) contributes the following theory (although he says it is not original as he saw it before in an article on RPMs, possibly by John Wexler). There is actually a fairly well known cause for the digit showing up clearer on later die stages. 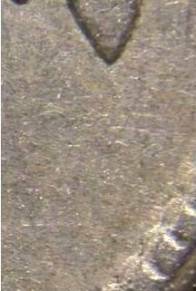 When a feature is punched into the die, the density of the metal directly under and alongside the punch is minutely higher than the surrounding metal. 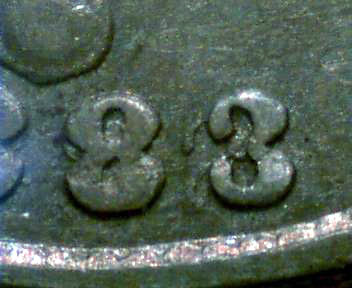 On a new die the underdigit may not show at all, as the new digit obscures signs of the old digit, and polishing has removed other traces of the underdigit. 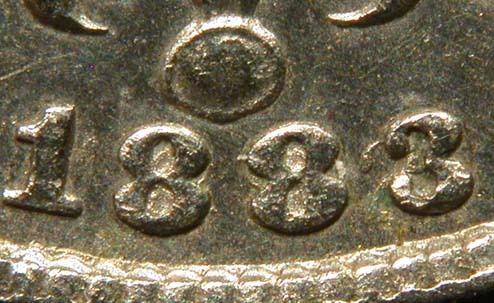 As the die wears, the slightly denser metal lasts longer, causing the eradicated digit to slowly reappear. This phenomena occurs in other applications, such as when gun manufacturers stamp the serial number on guns. This is why crime labs can raise serial numbers that have been filed off, and you can resurrect dates on Buffalo nickels. If you look at the three die stages on your web page, you'll notice that on the first stage, although the digit is visible, it is almost flat, while later states the underdigit rises and becomes stronger. 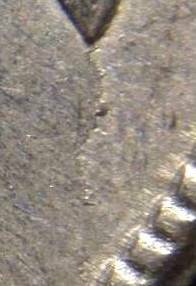 In discussions with Bernie Turner, who is very knowledgable about metallurgy, I have become convinced that the correct answer is that overdate shows more convincingly on later die stages because the mint increased the striking pressure to compensate for reduced metal flow due to the cracks. Of course, this just made the dies wear out faster! For reference, here are pictures of the full obverse and reverse of FS5c-013.